Patrick Dogue of Germany emerged from a high-class field to win Men’s Individual gold at the 46th CISM Military World Championships in Budapest (HUN). Dogue (GER) came from behind in the Laser Run to prevail ahead of silver medallist Zhang Linbin of China, and there was a huge roar when local hero Adam Marosi of Hungary came home in 3rd position to win bronze. There were no individual medals for France but, demonstrating typical strength in depth, they won the team gold thanks to the collective efforts of Valentin Belaud, Christopher Patte and Alexandre Henrard, with Germany winning silver and Italy bronze. Gustav Gustav of Austria led after the Swimming (1:58.10), followed by Matteo Cicinelli of Italy (1:58.44) and defending champion Marosi (HUN, 1:58.73). Fencing was very tight, with Alexander Nobis (GER) scoring highest (238), three points more than Yuriy Fedechko of Ukraine and six more than Hojoon Song of Korea. There were six clean rounds in Riding, with Marosi (HUN), Felipe Nascimento of Brazil and Alexander Lifanov of Russia standing out. 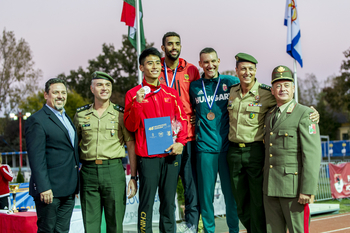 The CISM 2018 Military World Championships conclude with the Mixed Relay on September 29.